Wylie and Lochhead. 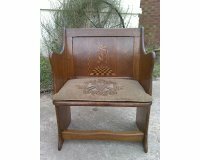 A good Glasgow School oak settle in the manner of M H Baliie Scott, with chequred inlay to the forward uprights. 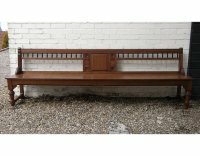 A good quality Aesthetic Movement oak bench the design attributed to Bruce Talbert and the quality of Gillows, with carved florets to the centre. Height 33 1/4", Length 8' 4", Depth 19". Circa 1880. 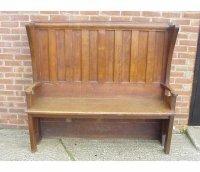 An Arts and Crafts oak settle from the family of Sir Samuel Morton Peto the great Victorian Industrialist and railway pioneer. Made for his grand daughter Audrey Elizabeth Peto who was born 21 Apr 1894. This unique little settle with curved and shaped arms stands on six legs with ‘Audrey Elizabeth Peto’ carved into the back and beautiful stylised floral inlays of fruitwoods and Mother Of Pearl. The lower frieze is intricately carved with repeating nursery themes of piggy's and trees. Length 36", Height 33 1/2", Depth 13 1/2". Circa late 1890's. 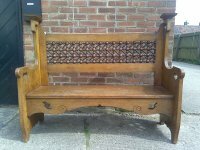 A small oak Gothic pew with nicley angled sides and trefoil carved detail to one side and further carving beneath each arm with tramline details to the back and a rollover top rail. Height 35" Width 49 1/2", Depth 19 1/2". Circa 1880. 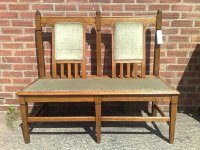 An Arts and Crafts oak settle by Liberty and Co with stylised Ying Yang cut-out to the back and typical Liberty squashed Heart cut-outs to the sides with lift up seat for storage. The front inlaid with Dutch children and a Flute player playing to a Dutch child. 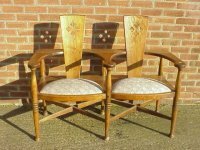 Two Rare 1960's Swedish oak armchairs (one shown) in the Arts and Crafts style with sculptured and elongated rear corner supports and mushroom style front hand rests and exposed peg details, a well made quality set. 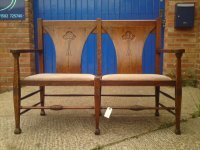 An Arts and Crafts Oak settle in the style of CFA Voysey, retaining it's original Arts and Crafts fabric, the fabric attributed to The Silver Studio's for Liberty and Co,. lifts up seat with storage below. A Liberty and Co oak settle with pierced hearts, scribed and cout-out details and unusually large Musharabieh turnings to the back. . Height 45 1/2", Width 58", Depth 21". Circa 1895. 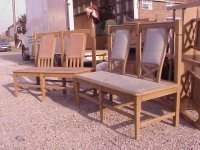 Five Glasgow School oak benches with shaped back rests. There are two pairs and one with different back details, two as above with finials. Two with cross backs and one plain without finials. Attributed to Wylie and Lochhead. Functional without arms they also work as piano duet benches. Height 43”, Length 4’, Depth 22”. Circa 1900. 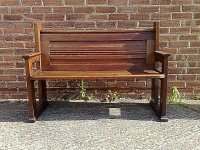 Four good quality oak Glasgow School benches with shaped back rests each with different details below some with crosses some with slats and two plain variations, these without finials. See above for a re-finished version. Height 41”, Length 4’, Depth 22”. Circa 1900. 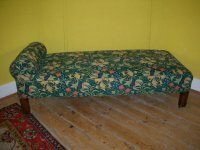 An Arts and Crafts oak day bed professionally upholstered with a Morris and Co fabric. 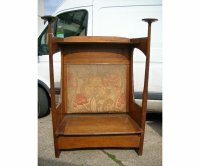 An unusual Arts and Crafts little oak settle with an intricately inlaid and painted back panel with original cushion. Height 30 1/2", Width 22 1/4", Depth 16". Circa 1910. 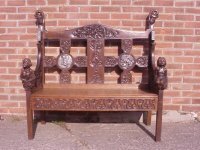 A Celtic Arts and Crafts carved oak settle with carved dragons to the tops and heavy gage pewter mounts below and carved Celtic interlaced stylised floral carving to the top rail, centre panel, to the left and right there are 2 Celtic crosses with further carved details centered with fantastic heavy gage Pewter panels, the left panel depicting an Angel and the right panel with the face of an Angel and the back of an Angels head sitting in the clouds. Angels carved to the upper part of each front leg, inscription to the back 'REST and be THANKFUL' carved entwined initials 'AP' and to the left a carved date of '1903'. Height 49 1/2", Depth 23", Width 52 1/2". C1903. 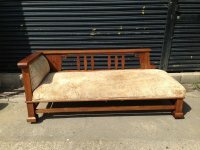 An Arts and Crafts Love Seat, design attributed toGeorge Walton and made by William Birch . 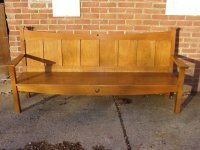 A stylish super quality solid oak Arts and Crafts chaise lounge attributed to Liberty and Co with six shaped spindles to the back flanked by angular details to each end each with a precise stylised tulip cut-out. 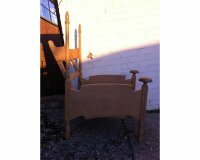 With chunky square legs and flaring feet united all around by square shaped stretchers. Measures Height 29 3/4", Length 6' 1", Depth 29". Circa 1900. 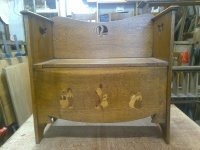 A well designed good quality Arts and Crafts oak settle with sweeping top, simple stylised cut out with a gentle sweeping curve under seat centred with a single pierced heart. An important Arts and Crafts Glasgow School oak settle designed by George Walton one of two ever made for one his earliest Kodak commissions at 59, Brompton Rd, London. The pure Glasgow design is very complicated indeed and one can see Mackintosh's influence clearly in this piece which would have rubbed off on him while working with Mackintosh for Miss Cranston's tearooms. 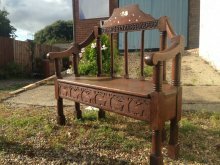 An Arts and crafts oak settle the design attributed to George Walton and made by William Birch with stylised floral carved details to the shaped back making it a very comfortable seat. Height 39 1/2" Width 54", Depth 22". Circa 1900.